Hula hoops have a rich history dating back to ancient Greece. While they weren't called hula hoops back then, they were used in much the same way they are now -- as toys for children and as exercise equipment for adults. Hooping is an excellent form of exercise for the entire body, helping you burn calories to lose weight around your midsection and tone the muscles of your core for a slim and strong waist. To slim your waist you have to shed body fat by burning calories. Any type of activity that gets your heart rate up is effective. 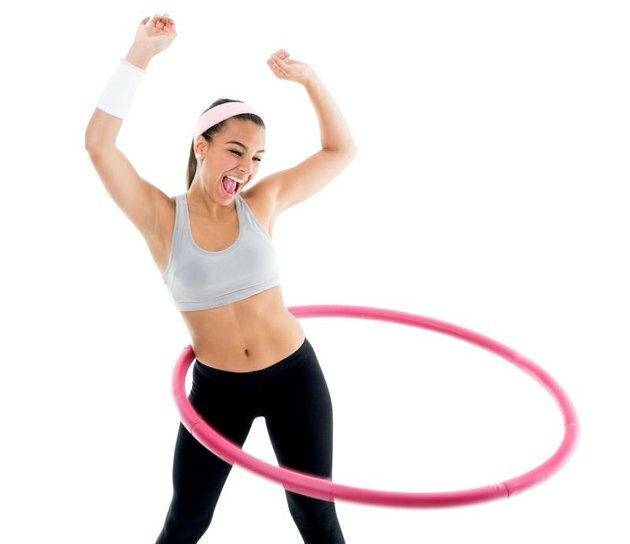 A 2010 study by the American Council on Exercise found that hooping burns about 7 calories per minute, or about 210 calories during a 30-minute workout. How many calories you'll ultimately burn depends on your age, gender, weight, the intensity of your workout and your current fitness level. ACE researchers also looked at how the calorie-burning potential of hooping compared to other popular workouts. Out of eight different workouts, hooping came in third for calories burned per minute, behind cardio kickboxing and boot camp. However, the difference was less than 1 calorie per minute, or 30 calories per half hour. 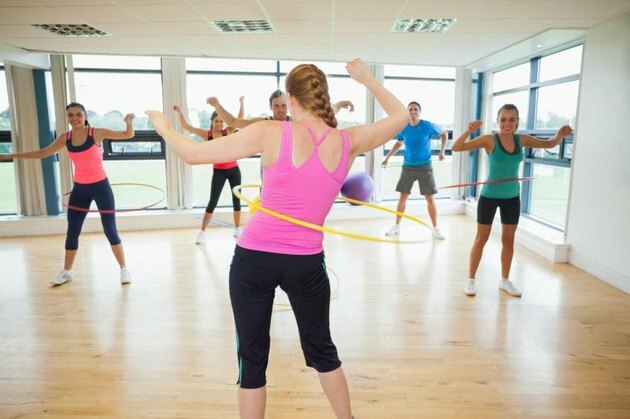 Read more: What Muscles Does Hula-Hooping Work? In addition to burning belly fat, you also need to tone the muscles of your midsection -- abs, obliques, hips and lower back -- to achieve a slim waist. Rocking your hips from side to side to keep the hoop circling around your waist activates all the muscles of your core. Stretch and tone the obliques with side bends: Hold the hoop behind you with the bottom of the hoop at your lower back and the top of the hoop above your head. Bend over to one side, come back to center, then bend to the other side. Work the obliques with ninja passes: Hold the hoop in front of you with both hands so that it's parallel to the ground. Get into an athletic stance with knees slightly bent. Keep the hoop close to your body as you as you rotate your torso to the right, transferring the hoop into your right hand and bringing it back behind your body. Then, rotate your torso to the left, transferring the hoop to the left hand. Keep your feet grounded as you do this, rotating mainly from the torso and not the hips. Sculpt the abs with hoop sit ups: Lie on an exercise mat on your back with your knees bent and your feet flat on the floor. Position your hoop underneath you so that the bottom of the hoop is under your mid-back and the top of the hoop is above your head. Grasp the sides of the hoop. Contract your abs and lift your shoulder blades a few inches off the floor. Hold for one to two seconds at the top, then return to the starting position. ACE: ACE-sponsored Research: Hooping—Effective Workout or Child’s Play?